Stunning mountains, gorgeous glaciers, marine and land wildlife these are just a few of the attractions you will see while taking a cruise to Alaska. The famed inside passage is as beautiful a waterway as you will find anywhere in the world. When you sit on the deck and watch the amazing scenery go by you might even forget that you are on a cruise ship, at least until it is time for dinner when you’ll be more than happy to let someone else do the cooking for you. Alaska cruises have exploded (figuratively) over the past decade with an increasing number of ships taking people to see the glory. This explosion means that when you are off the boat exploring the port towns or wildlife you will likely have a lot of company. In fact, it can be downright crowded in a state that isn’t exactly known for its crowds of humans. The popularity also means that prices on cruises to Alaska are more reasonable than ever before. 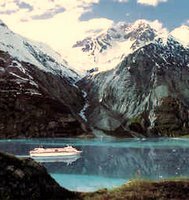 If you have the travel flexibility you can save even more if you book a last minute cruise to Alaska. Cruise ships would rather have rooms filled than empty so last minute deals are often steeply discounted.